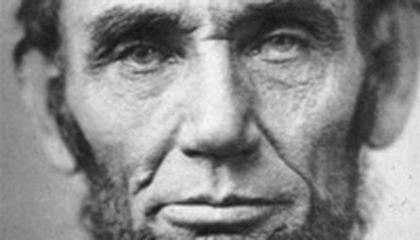 It's one of the most famous Abraham Lincoln photographs. That's because no one knew the picture of the president existed until nearly a century later when a 14-year-old boy found it. Now Ronald Rietveld, the boy who made the discovery, who is now a retired historian, will donate his original notes about the picture to the Abraham Lincoln Presidential Library and Museum in Springfield, Illinois. The photo marks one of the last chapters of a story that began in April 1865. It was just days after Lincoln was assassinated in Washington. 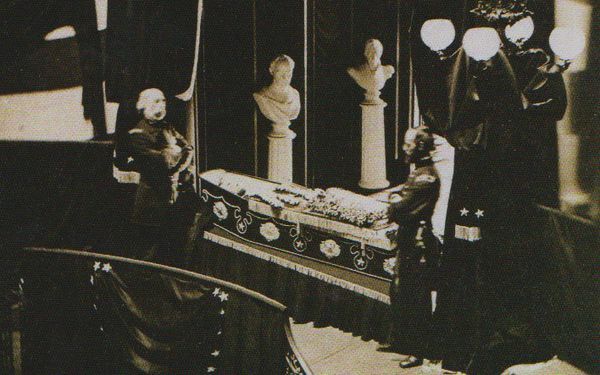 On a stop in New York City, one of a number of places where Lincoln's remains were displayed while being taken by train to Springfield for burial, a photographer was allowed to take a picture of the president in an open coffin. Lincoln's secretary of war, Edwin M. Stanton, apparently heard about the photograph. He ordered it and all prints and negatives destroyed. All were, except for one sent to Stanton. Rietveld enters the story in the early 1950s. As a teenager fascinated with Lincoln, he attended the dedication of a collection of Lincoln-related items at the University of Iowa. Harry Pratt, the state historian of Illinois and a Lincoln scholar, was so impressed with Rietveld that he invited him to Springfield to see the 16th president's home and tomb. Pratt also let Rietveld look through papers of John Nicolay and John Hay. They were White House secretaries when Lincoln was president. Rietveld came upon an envelope sent to Nicolay in 1887 by Stanton's son. The son explained that he'd found some of his father's papers and thought Nicolay might want them. "Then I opened up the folded sheet of plain stationery and there lay a faded brown photograph," Rietveld wrote in an article that appeared in Abraham Lincoln Online. Pratt told Rietveld to keep quiet about the photo until he could determine its authenticity. Rietveld returned home to Iowa where he didn't say a word to anyone, including his mother. "She wanted to know what I had done wrong," said Rietveld, chuckling at the memory. "I told her I didn't do anything wrong, I'd found the photograph during the summer in Springfield. The AP (Associated Press) had put my name all over the country." Critical thinking challenge: Why was Lincoln taken to Springfield, Illinois for burial? See an historic event captured in a photo is very remarkable. Lincoln was a man who let all of the Slaves free during that time and era. Now the boy that took this photo was very interested in such a man the story said. This is just an incredible picture and photo taken. Wow that's pretty amazing that an 14 year old boy found a very rare and valuable picture.It was very kind of him to give it to the museum. Although if i found that picture i would have at least told my mom i'm surprised that Rietveld didn't tell his mom. Lincoln was taken to Springfield, Illinois because that was his home. It is pretty cool that a teenager found that rare photo of Lincoln. It must of been hard not to tell anyone about the photo and have his name all over the front page. Wow I didn't think a 14-year-old kid would find such a cool picture. I think if I found a picture that was that old I think I would make sure it was real, then I would give it to the Abraham Lincoln memorial. Even though I dont know this kid I would be honored to meet him and ask him questions about it. I wonder how he knew it wasn't a fake. Did he?. Wow that is cool that someone so young found that photo. If I found that Photo I would make sure it was real and then show it to people. I would also be really careful with it. Abraham Lincoln was a good man. Didnt you like him? Now I want to be a president to. You can find Mr. Lincoln on pennies. I have 137 pennies. This article relates back to science in that the people can retell of a rare photo of Lincoln. We are all apart of nature, even history. A 16 year old boy named Ronald Rietveld found a picture of president Lincoln. The picture was of president Lincoln in his coffin. The pictures were ordered to be destroyed but one picture was sent to Stanton, California. That was when Ronald found the pictures and was all over the news. Lincoln's picture was only taken once. Ronald Rietvled, a 14 year old at the time found the photograph in an old letter from Edwin Stanton's (Lincoln's secretary of war) son to John Nicolay (Lincoln's new secretary). He wasn't allowed to tell anyone that he found it over the summer at Lincoln's burial site (Springfield, Illinois) in an old file from there. He wasn't allowed to tell his mother, his friends, or his family. The headlines finally came out with the picture and Rietveld's name on it. He and his family were overjoyed to see that Ronald had found the picture. I think it would have been very exiting to be Ronald Rietvled at that time and to see how exiting it would be to make the front page of the newspaper doing what you love to do with the things that you love. Its pretty awsome hearing about this kind of stuff, i mean like its so instersting learning about random stuff. Its old and worth reading!